A complex picture of race relations emerges at the level of the city-region where survey data suggests that many residents lack confidence in other races, whether black, white, coloured or Indian. Positively, the graphs below show that strongly held attitudes of distrust weakened between 2009 and 2011. Yet, the same graphs show perceptions of mistrust are high and suggest that the state of race relations could still be a threat to the social fabric of the city-region which is also challenged by other forms of intolerance including xenophobia and gender based violence. Survey-based evidence shows the existence of a strong national identity and commitment to a ‘new South Africa’. Surveys such as the 2011 Reconciliation Barometer show widespread popular consensus on the existence of a relatively stable South African political community which transcends racial and economic divisions. 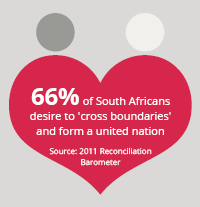 For example, one encouraging finding from the 2011 Reconciliation Barometer is that 66% of South Africans desire to “cross boundaries and form a united nation”, indicating a widespread commitment from South Africans to the goal of moving forward from the racialised divisions of the past. However, in general an overall picture of national and provincial survey data appears to present a rather pessimistic prognosis of race relations. Markinor survey data on national attitudes to “People confident in a happy future for all races, 2000-2011” shows a downward trend with 2008-2011 showing the lowest percentages over the last decade, ranging between 61% and 64% of people confident of a happy future for all races. 2012 saw a further dramatic drop, with only 58% expressing confidence in a happy future for all races. The same survey shows that public opinion about race relations has been steadily declining. In 2004, 60% of respondents were of the opinion that "race relations are improving". In 2012 only 39% felt that they were. What are the conditions necessary to develop an inclusive and socially cohesive society? When considering the scope and the scale of the challenges in terms of overcoming racial barriers and promoting racial integration, it is clear that there is a significant task at hand in establishing the kind of inclusive and socially cohesive society called for in crucial policy initiatives such as the National Planning Commission and G2055. Is the state the most obvious agent for social cohesion? Often the state is invoked as a crucial actor in establishing the conditions necessary to develop and consolidate social cohesion. The NDP speaks to a ‘competent developmental state’ and G2055 positions the state as an important lever in social transformation.